Scoreboard watching at Citi Field. Arizona @ New York Mets: Wade Miley (4-7, 4.55) vs. Shaun Marcum (1-9, 5.08). Shaun of the rolling over and playing dead? Well, the good news, I suppose, is that Marcum earned his first win of the year in his last outing, a 3-0 win over the White Sox in which Marcum went 8.0 IP. On the other hand, the D'backs don't see a real Met pitcher until game 3 of the series on Wednesday, when they draw Matt Harvey. Boo. San Diego @ Miami: Jason Marquis (9-3, 3.99) vs. Jose Fernandez (4-4, 2.98). Fernandez is tied for the team lead in wins, along with Dodger trade bait Ricky Nolasco (who is 4-8). Fernandez also leads the team in IP (84.2) and Ks (84), which by my math works out to about a K an inning. Graduate education, baby! San Francisco @ Cincinnati: Mike Kickham (0-2, 10.57) vs. Bronson Arroyo (6-6, 3.61). Kickham is pretty green, while Arroyo has long flowing hair. Put 'em together, and you've got the She-Hulk. Of course there's a J Scott Campbell She-Hulk, right? I've never been a fan of the Amazonian body type. CIN also up on SF, 2-0. Giants in trouble again. Two on and one out. Kickham getting kicked around. Vagiants now down 7-1 in the 5th inning. AZ up 3-0, T6. The Mets' Eric Young just made a ridiculously stupid jump for a pop fly that bounced out of his glove; it was like Young thought the wall was a heck of a lot closer than it actually was. Cody Ross ends up with a leadoff double in the top of the sixth. Marlins up on Padres 4-0, B7. Marlins have one out and a man on first. Reds now up 8-1 on Giants, B5. Reds have two on with two out. Arroyo at the plate, facing George Kontos. Kickham lasted 2.2 and gave up 7 ER. But he did get two Ks! San Diego down to its final out, down 4-0 in Miami. 3-2 count. Headley singles, so Padres at the corners. It's raining in Cincinnati, having completed six full innings. Reds 8, Giants 1. Kyle Blanks makes the third out. Padres lose. David Wright just knocked in Eric Young, and now there are first and second with 1 out. Gibby going to the pen. Good job Marlins. Come on, Mets. Whoo, Cishek gets the 1-out save for the Marlins. My fantasy team is thrilled. 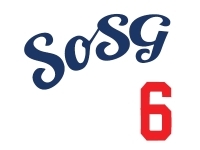 Josh Satin of the Mets hits a sure 6-4-3 double play ball, but Didi Gregorious botches the 6-4 part so they only turn the force out at second. First and third, two out. John Buck (batting .206) fouls out to first. 1 out triple for the Mets. Nasty fall by Parra, including a faceplant. Mets' Omar Quintanilla legs out a triple. One out. Mets one out away from blowing another opportunity. Eric Young doubles in Quintanilla, then got to third on a WP...but that's it. AZ 3, Mets 2, through 8. Well, they got one run at least. When did EYjr go to the Mets? Last chance for the nigh mets. Why am a blacked out from Baseball Tonight? That was close to getting out. Oh man I thought he was dead on that play. Just get a bs base hit to left field. Mets with the late-innings picket fence. You're our only hope, Daniel Murphy! why is there a can of Pam on the Mets bench? 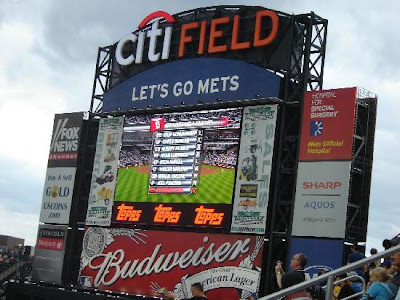 It has taken me awhile to figure out the mets scoreboard configuration. I must be tired. Mets have used four PH tonight, batting .128, .157, .197, and .250. Unsurprisingly, none of them have gotten a hit. Get a steal little little EY! I'm gonna wake up and Ned will have traded the Dodgers for the Cubs. This game is still going on? C'mon Wright, send us home. Wait, I'm already at home. David Wright can't come through. Pops up low pitch to short CF to end 12th inning. We are headed to 13 in Queens! Damn you, former Dodger Cody Ross. Good job, good effort, Mets. Fing Cody Ross hurts the Dodgers even when the Dodgers are idle. Wow, Diamondbacks, Padres, and Giants all lose.